This commemorates a possible performance from the play Suda no haru geiko katagi (隅田春妓女容性), at an unidentified theater in Osaka or it could be a a mitate. A very rare design and most unusual format (chūban yoko okubi-e) by a pupil of Sadamasu (possibly using a pseudonym in the early days following the Tenpō Reforms ban on actor prints). 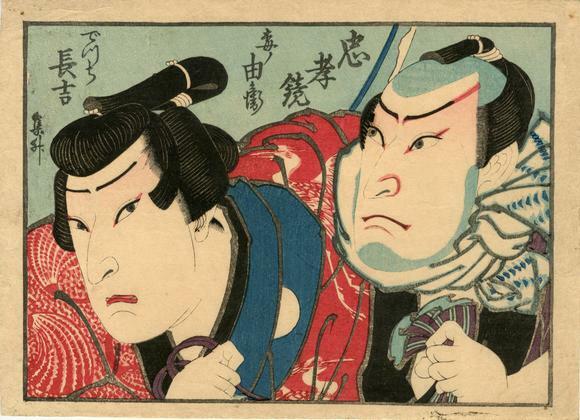 Illustrated in Ikeda Bunko, Kamigata Yakusha-e Shusei (Collected Kamigata Actor Prints) Volume 3, Ikeda Bunko Library, Osaka 2001, no. 237.